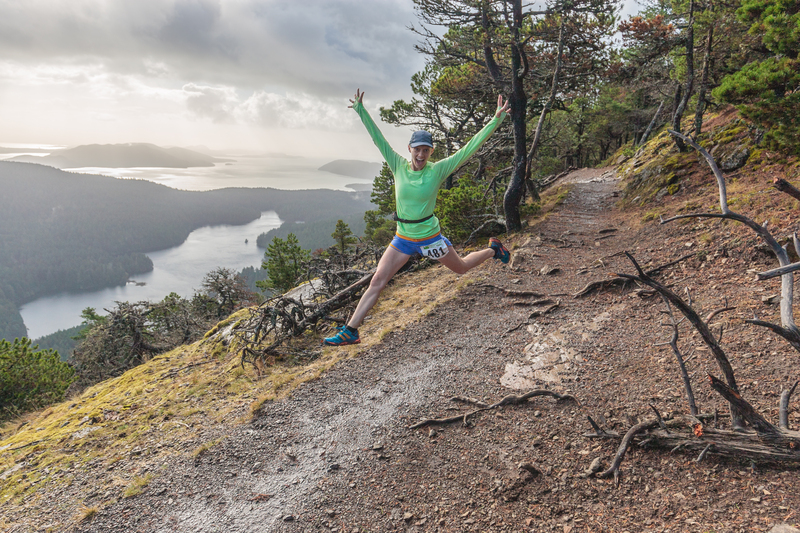 The Moran Constitutional Relay is a challenging 70-mile course with 12 legs for teams of two to six runners on the breathtakingly beautiful trails of Moran State Park on Orcas Island. The park, situated in the San Juan Islands a little over three hours from Seattle, is world renowned for its scenic beauty, including intimate looks at varying plant communities among the vast forests and rocky balds, the craftsmanship of the many structures built of rugged natural materials by the Civilian Conservation Corps eight decades ago, lakes, streams, verdant wetlands, and sweeping vistas from 2399-foot Mount Constitution of neighboring straits, islands, and beyond them, mountains. 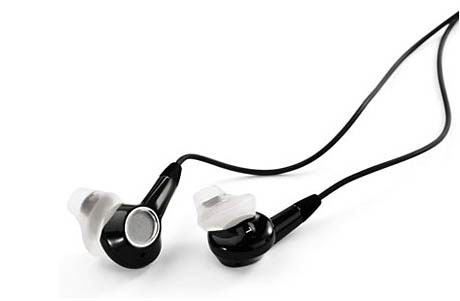 The legs were designed to provide variety, with varying lengths and profiles. Some legs have substantial climb, others are mostly downhill, and others are flatter or have ups and downs equally. Distances range from three to nine miles. Team members are free to divide the legs among runners in whatever way they would like, as long as each member completes two legs. A runner could even do consecutive legs, if they wanted. The relay will be in two stages, with the first eight legs run on Saturday, and the last four on Sunday. In the evening between, enjoy a meal and camaraderie at the Environmental Learning Center, and sleep in the onsite cabins or use a campsite for a rustic, closer-to-nature experience. All runners will receive an event t-shirt, and finisher medals await teams that complete the entire course. Entry also includes a hearty meal at both days’ finish, as well as a pasta dinner Friday before the relay and continental breakfast both days before the start. San Francisco Bay Gourmet Coffee is fairly traded and gives back to the coffee farming communities! Registration is limited to the first 50 teams, and we expect the race to fill. Once the race is fully subscribed, we will admit teams from the waiting list as space becomes available. Registration is by team, and the team registration price is according to team size and registration date. Register early to take advantage of the early registration deals. 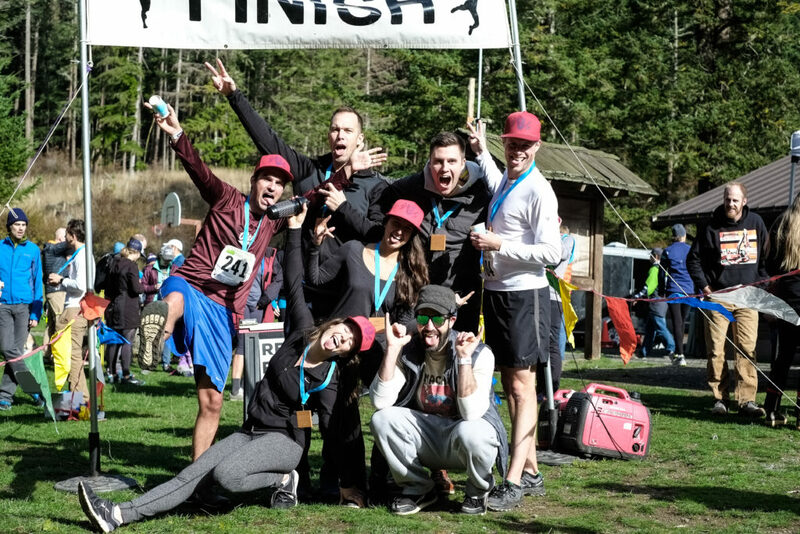 If plans change and you later need to reduce your team size, you may be eligible for an entry credit toward another Northwest Trail Runs event, or a refund of excess entry fees. See the schedule below for our refund policy, which applies to teams that are reducing in size or dropping out. If you end up needing to increase your team size, you can add individual members, and they will be able to register separately. The total team cost will be a bit higher if members are added separately, since accepting registrations for an entire team at once makes things smoother for our staff. Q: What if I don’t know who all my team members will be yet? A: Just list as many names as you can now, and put “TBD” (to be determined) for the rest. We’ll provide a way to submit additional team member info later. Each team is asked to provide a volunteer to help staff the event. 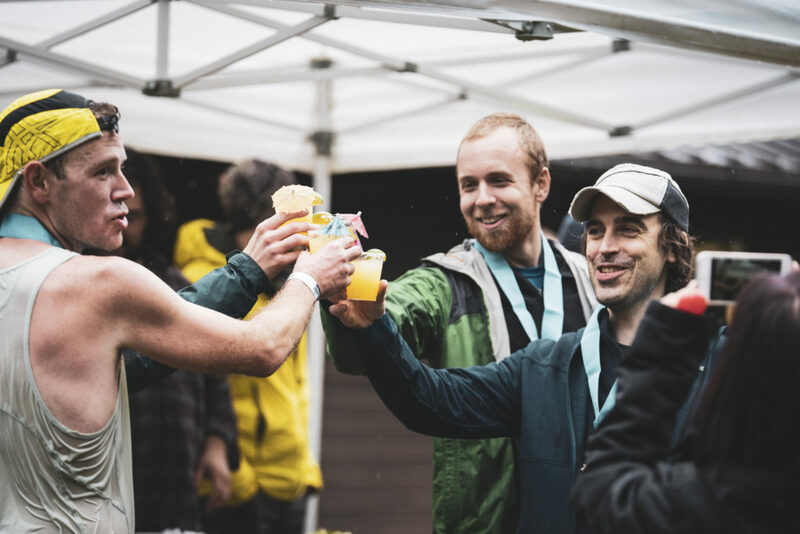 Volunteer check in and training will take place during runner check in on Friday, and volunteers will be asked to work for up to 6 hours, most likely at the headquarters, at one of the exchange points, or at another point along the course. Teams that are unable or do not wish to provide a volunteer may opt to pay an additional $120 instead. The volunteer declaration or payment due date is September 14, and teams registering after that date are asked to submit their volunteer declaration or payment when they register. The PayPal buttons below can be used to pay the volunteer fee or pay for ELC lodging, if these were not already paid for at the time of team registration. The fee for adding a member to an existing team is based on the date that the team member registers: $109 by 2/16, $119 by 4/6, $129 by 8/30, and $144 by 10/14. Payment buttons are below for the Volunteer fee and other options, if adding them after team registration has already been completed. You can navigate back to this page to click the buttons more than once to pay for more than one person or option. Once you have added the items you would like to pay for, use the “View Cart” button to check out and pay. If using PayPal presents a problem for you, you may contact us about sending a check instead. Whose lodging is payment for? If we are not able to fill a cancelling team’s slot, then no refund will be offered. The presence of a waiting list does not guarantee that we will be able to fill the slot, since teams that sign up on the wait list may not be able to commit on short notice. For teams that are reducing in size, any refund due will be calculated using the entry prices on the date that we receive notification of the team size change. For example, if a 6-person team registers on February 8 for $639 (opening price) and changes to a 4-person team on March 30 (early price period), then the refund amount would be the registration fee paid ($639) minus the 4-person team early price ($509) minus the $25 fee for cancellation by 7/31, or $105. Significant reductions in team size may be subject to the same treatment as cancellations: We will only offer money back if new teams register or new members join existing teams to fill that capacity. 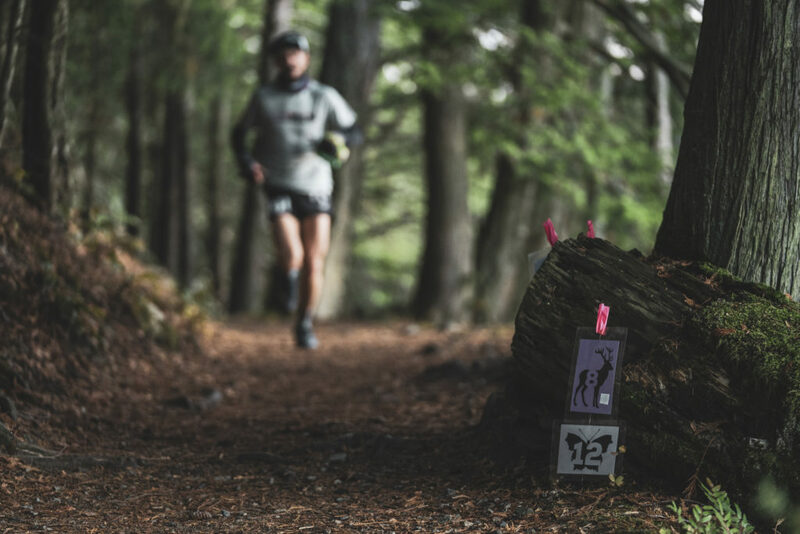 Most of the trails traversed by the course are well-groomed, non-technical, and very easily runnable, however a few of the trails have some moderately technical parts. Elevation loss will ratchet up the technical challenge in the steeper parts, due to the greater speed and commensurately greater force at work on the ankles and other joints, so runners on legs with significant drop should be prepared to watch where they place their feet more carefully. 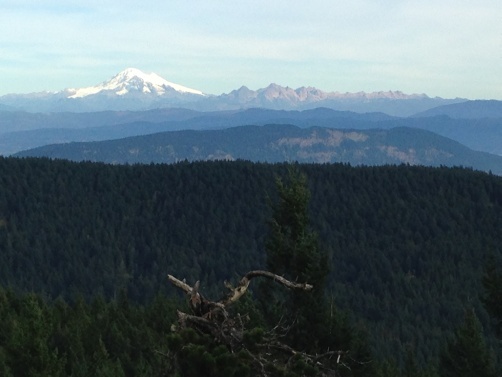 Check out this preview of the course by Adam Stuhlfaut, Director of Running at SHOES-n-FEET in Bellevue. Here is the leg information for Saturday (first eight legs) and Sunday (last four legs). A course map for each leg is linked from the word “Map” in the tables below. Here is a map that shows all twelve courses. 5:30-8:30 PM – Post-race meal and raffle (included with entry; raffle begins at 7:00 PM). 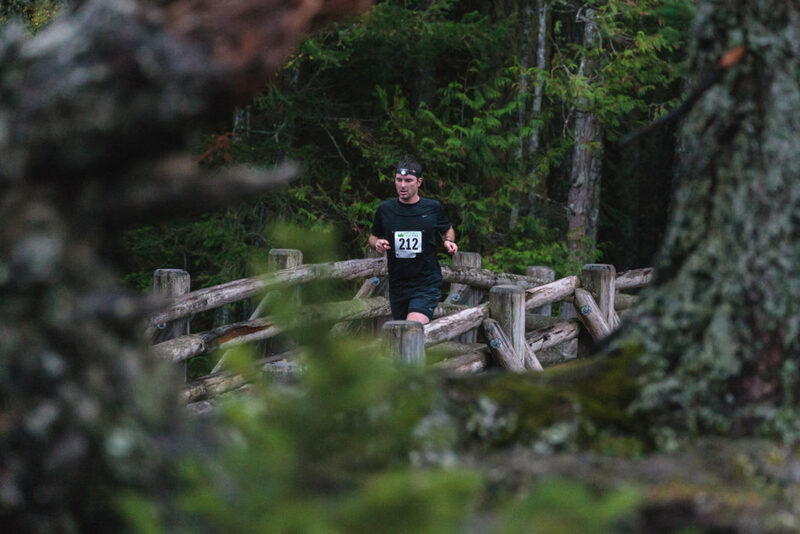 * For teams that are going much faster or slower than teams have run this course in the past, we may assign a special start time up to an hour earlier or later on Sunday. 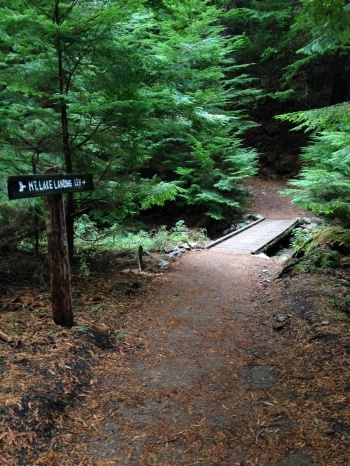 Moran State Park is located about 25 minutes drive from the ferry terminal on Orcas Island. Here is a map that you can use to get directions. Parking is limited near the event center, and signage and volunteers will be on hand to direct you. More detailed parking instructions may be added shortly before the weekend of the event. Washington State Ferries provides several sailings throughout the day from the city of Anacortes to Orcas Island. Here is the Fall 2018 sailing schedule (web), and as a PDF. Once the 2019 schedule is available, we will post it here. In addition, Washington State Ferries’ service from Canada runs from Sidney, BC on Vancouver Island, however service is not direct, so a stopover on San Juan Island or in Anacortes would be necessary. 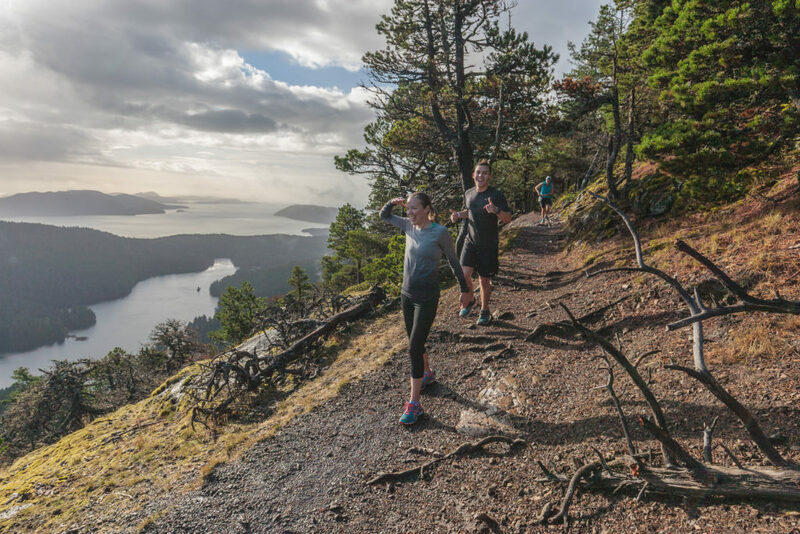 This may not be the most efficient way to reach Orcas Island, but from a tourism standpoint, a stopover on San Juan Island or a long ferry voyage to Anacortes and part way back are both fantastic ways to spend a travel day. Lodging is available onsite, with beds in a cabin or A-frame available for Friday and Saturday nights. Two-night accommodations can be booked during the registration process at the package price of $40. You can also optionally add Sunday night for an additional $20. All meals, including the Friday night dinner, is in included in your entry. All meals will include vegan and gluten-free options (please note we are not GF/Vegan kitchen). Here is the 2018 menu. Camp sites are another lodging option in the park, and in October, they are first-come, first-served. Pay for camping directly to the park when you arrive and select a site. There are also at least a couple of resorts on the island, as well as numerous bed and breakfast establishments. Golden Tree Hostel – a budget accommodation in the town of Eastsound. The link is unlisted. You will not find it on Google or by searching. You must have the link to view and the password to download. 3.) Once I have received payment via Paypal I’ll email a password for the galleries and you can begin downloading photos. A couple notes about the galleries… I obviously wasn’t able to get photos of everyone since I was the only one shooting. Hopefully I got most of you in the 500+ photos I’ve posted. All the photos in the galleries are organized chronologically, morning to night, start to finish. They are sized for digital sharing and should print to something like 8×10″ size if desired. If you have any questions feel free to email me. Thank you all in advance for your business! Your payment ensures I can continue to do my job and feed myself! Both the 2016 & 2017 Moran Constitutional Relay photos were shot by Pronounce Photography (now Jarad Long Photography). At check-in, we will provide each team with a packet of important events notes and a map of parking and exchange areas. We will also post the documents here, so that teams who would like additional copies can print them. Here is the 2018 Event Info Packet for teams. A similar packet will be provided for this year’s event. Cellular phone coverage is spotty throughout the park, and is poor at the ELC (start/finish location). You should not rely on your cell phone as a real-time means to keep in touch with your team about event weekend logistics. These rules are intended to make the event a meaningful challenge and a fun and fair competition. Please familiarize yourself with these rules, and interpret them in a spirit of fair play. If you have questions or feel that there are issues that we haven’t covered, then please contact us at events@mergeo.com. Follow the instructions of race staff. They are there to help everyone have a safe and fun event. Each team will be allowed two vehicles to transport team members to exchange zones on course, and passes will be provided at check in that will identify these vehicles. Each runner on a team must complete at least two legs for the team to have an official finish. Exceptions may be made in case of injury, in which case the injured runner may be withdrawn and another runner from the team may continue the leg abandoned by the injured runner where she or he left off. A withdrawn runner may not run again during the event. It is up to the team which runner runs each leg, however all runners must check in with start or exchange zone race staff before they are tagged off by their runner and start on the next leg. Teams that are at risk of being overtime may be asked by race staff to start later legs of the course before the preceding runner reaches the exchange zone. If this is done, the team’s rank will nonetheless be based on the sum of the running times of the team members. Teams that are progressing around the course faster than anticipated may be asked by race staff to delay starting a subsequent leg in order to wait until an exchange zone opens. If this is done, the team will receive time credit for any time waiting to start at an exchange zone. All members of each team must check in at the race on Friday, October 21. Any additions to a team roster must be made at the latest by the time check in closes on Friday. Course routes for each leg will be well marked, and it is the responsibility of each runner to be familiar with their route and the course markings and to stay on course. Sunday start waves will be determined according to elapsed time on Saturday, with the fastest teams starting in the 8am wave, mid-pack teams starting in the 7am wave, and slower teams starting in the 6am wave. Wave divisions will be determined by race staff, and teams will be notified of their start wave at the finish on Saturday. Teams will likely be given the option of starting in an earlier wave, if they would like. Runners on the course during hours of darkness must carry and use a headlamp or flashlight. Safety is our first concern, so if you see an injured runner, please stop and help them. Race staff may award bonus time to compensate for such circumstances. At the exchange areas, always park as directed and so as not to block any road or trail. The trails will be open to other users during the event, including pedestrians with pets, and cyclists. Participants are responsible for their own safety while participating, and the organizers are neither qualified nor equipped to render medical care in the event of a serious injury. In case of an emergency, call 9-1-1. 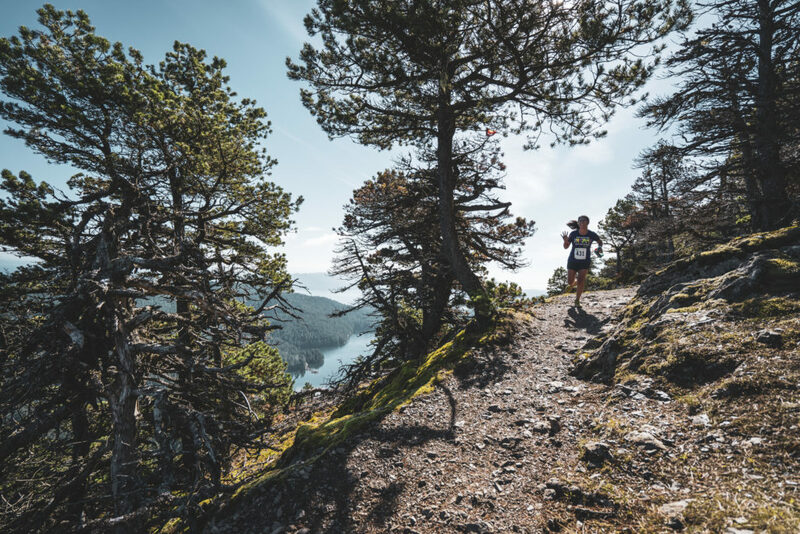 You are encouraged to bring a cell phone with you as a safety precaution, if you wish, however cellular phone coverage is spotty throughout the park, and is poor at the ELC (start/finish location). You should not rely on being able to reach anyone on your cell phone. Our events are USATF certificated and under USATF policies, dogs are not allowed on course. A tech t-shirt with event artwork is included with your entry. We will be contacting captains about a month before the race to confirm t-shirt sizes for teammates and for your volunteer. You will also have the option to purchase Northwest Trail Runs branded apparel onsite, or you can order now at Running Bug Apparel.